The Alfa Romeo 2000 Sportiva is 2 litre sports car developed in the early 1950s. It was designed by Franco Scaglione from Bertone, two coupes and two roadsters (1900 Sport Spider) were made. The car was intended to go mass production but that never happened and Giulietta Sprint took its space as more mainstream mass production car. 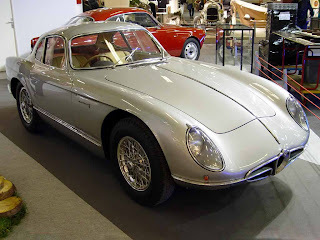 The 2000 Sportiva has 2 liter engine fed with two twin side Weber draft carburettors producing 138 PS (101 kW; 136 hp), that gave top speed of 220 km/h (137 mph). The all aluminum body sits in spaceframe chassis (seen also in Disco Volante) and the suspension has De Dion axle at the rear. Last updated on 10 August 2013 at 19:28.